Like any on-again, off-again relationship, my long-time love affair with fast fashion is a complicated one. It feels like a million years ago when we met, but the more I got to know about fast fashion, I felt it just wasn't right for me. As I began to understand its detrimental social and environmental impacts (one viewing of The True Cost on Netflix is very enlightening), I've been trying my best to shop sustainably. I've always loved vintage and thrift shopping, but increasingly buying secondhand has become my true love and fast fashion, my mistress. Like with any breakup, I'm trying to shift my focus onto the positive. Shopping smaller brands, especially on Instagram, brings me so much joy. I recently bought a top from Maison Cléo, which was £90 (the equivalent of two mid-range high-street tops) that I wear on repeat. Every time I pull it out, I love telling the story about chatting with the designer in my DMs. This kind of value is something I could never get from a quick high-street fix. I feel similarly about all of my vintage pieces, and I've channelled my love of shopping into hunting down the best pieces on Vestiaire Collective, eBay, or charity shops. I'm still careful about what I choose to invest in, but when I do, I relish the story that comes with each unique piece. In turn, I feel reluctant to get rid of one of these treasures when I do a wardrobe clearout. I try not to judge myself in the rarer moments that I do shop fast fashion; the point is not to feel guilty, like I've failed or given in. I just try to ask myself why I am doing it; do I genuinely love the piece and will I wear it over and over? If I do shop on the high street, I try to take a step back out of the impulse of the moment by checking where the piece was made and what materials it's made from. If I'm shopping online, I wish list an item and try to return to it a week or two later to see how it feels. I am still reconciling my relationship with the high street, and below are the pieces I'm having a harder time quitting. Keep scrolling to see which pieces are the hardest to let go of and how I am hoping to change these habits. 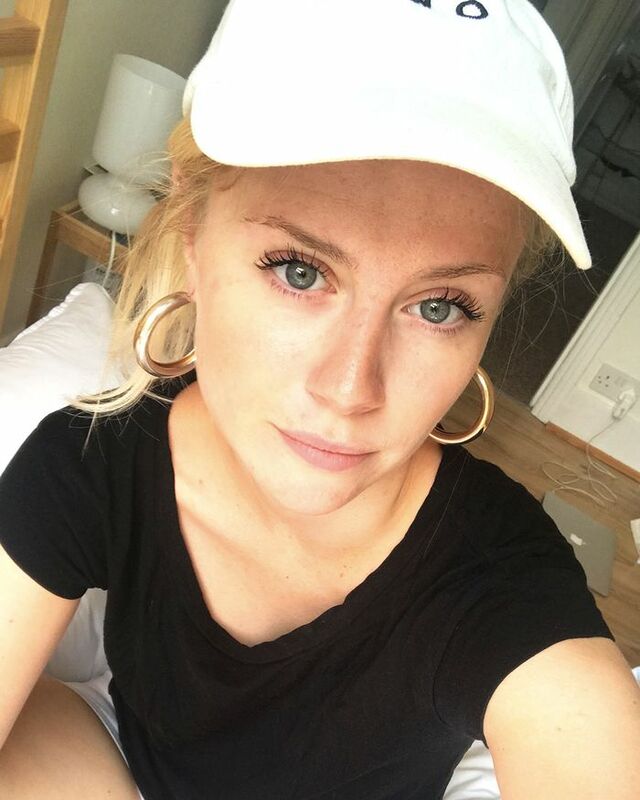 My £7 gold hoops from H&M have been my go-to season after season. I've probably bought five or six pairs of them, having worn them until they turn green. Spending £100 on a proper pair (that won't infect my ears) has always felt like a bit much, but if I do the math, I've nearly spent as much on repeat buying the cheaper versions. I'm thinking about saving up for these Laura Lombardi hoops, which are made exclusively in raw or recycled metals. Finding jeans that fit and felt good on me took so long there was a period of time when I just gave up on denim altogether. I finally found out that COS denim was my favourite thing on the planet, so it's become difficult to part with them. They are thinner than Levi's (the popular vintage denim choice) and fit my wide hips and small bum really nicely. As a result, I try to buy one pair a year, and it is my goal to spend time finding vintage or sustainable jeans that fit like these. Every so often, I have a Carrie Bradshaw moment and think that a new pair of fabulous shoes will solve my problems. Without a Manolo budget, these episodes result in a new pair of heels from the high street that I wear once. My goal is to try curving that habit and investing in classic pairs (from sustainable or smaller designer brands where possible) to wear on repeat. If I am having a wacky shoe impulse, I'll try to buy vintage designer pairs so I can truly fulfill my Carrie Bradshaw moment. Finding the best basics, like jeans, was a long journey for me and definitely the hardest to find secondhand for consistency and hygiene reasons. From underwear to basic tees, it's Marks & Spencer I love the most. In looking for sustainable options, Muji is the most sustainable on the high street, while brands like Fruity Booty and Base Range are sustainable brands we love for basics, though they are a bit more of an investment. So much of being more sustainable in my shopping habits is about shifting my perspective, and the best way of achieving that has been keeping the conversation going. As fashion and shopping lovers, we're learning together that less really is more. If you have questions about what shopping more sustainably, be sure to join our Facebook community.